The South Carolina Republican appeared on MSNBC's "Morning Joe" on Thursday to discuss his primary loss this week after being attacked by the president. 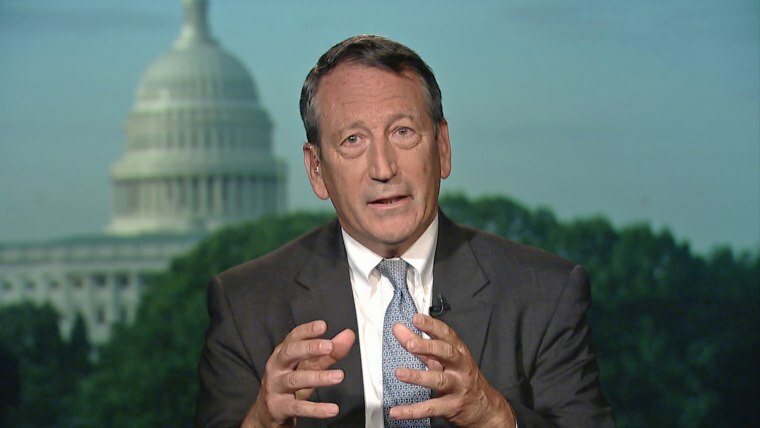 Rep. Mark Sanford of South Carolina, who lost his primary race this week hours after a last-minute Twitter broadside from President Donald Trump, warned his fellow Republicans on Thursday that the "question of allegiance" to Trump could damage the GOP. "We swear an allegiance to the Constitution and we pledge allegiance to the flag and what was weird about this race that I've never experienced before in any race I've been a part of was an allegiance question where people say, 'Are you for or against the president?'" Sanford told MSNBC's "Morning Joe." "I've never before had a question of allegiance to a person, rather than allegiance to the flag and Constitution, and to a degree that's what this race came down to," he added. Trump got in on the attack, too, in a tweet on Tuesday, just hours before polls closed, that ripped Sanford's disagreements with the president and the lawmaker's much-publicized extramarital affair with an Argentinian journalist. On "Morning Joe," Sanford acknowledged that Trump's tweet hurt him but also discussed how the nature of the president's "if you offend me, I'm coming back to get you"-style of involvement in his race was "a little outside the norm." Sanford admitted that the "traditional merit badges" of conservative values weren't a factor in the race and advised his fellow Republicans facing re-election on how best to avoid the president's ire during elections. "Pledge allegiance to Donald Trump," he said. Doing so, Sanford warned, could be "a mistake on a soul level." "There are always trade-offs in politics," he said, "but I think everybody has got to answer that question for themselves."